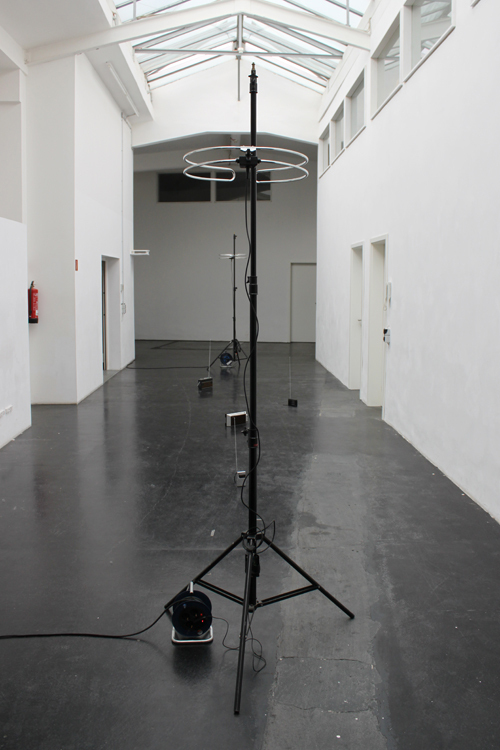 The minimal setup is composed of two radio stations using the same frequency which interfere in the exhibition space. By simultaneously broadcasting archive material from Radio Free Europe and Radio Romania the two transmissions effectively jam each other. It is only when someone carrying mobile radios or receivers moves through the space between both transmitters, that they can hear fragments from the two broadcasts. Listeners are thus caught between two logos (or two ideological positions), where beyond words, the ideological and media wars embody beings. 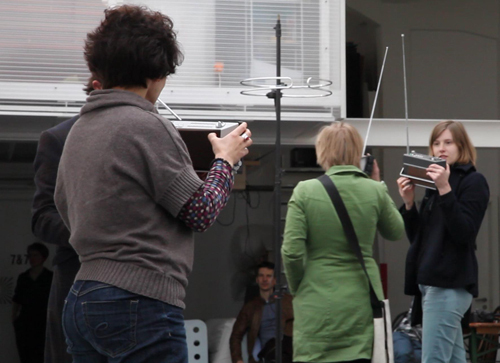 The result is a spontaneous choreography, re-enacting the “fight over hearts and minds” at the border between East and West as well as recalling the technological and ideological mechanisms used during the Cold War when Radio Free Europe was meant to counterbalance the socialist propaganda in the countries of Eastern Europe—and in consequence was jammed by Eastern authorities. By using DIY and Open-Source methods, the project also recalls the bricolage strategies used in the Soviet East by people trying to circumvent state propaganda. Modular, “Signal to Noise” can be set up in- or outdoors in varying spatial compositions by using varying broadcasting ranges. It may thus function as a temporal intervention in public space, interrupting regular radio programs with its two interfering ideologies. The participants can experience it by using any standard radio receiver. The installation is part of “Repertories of (in)discreetness” project – an art research project that has its starting point in the archives of Radio Free Europe (RFE) from the Open Society Archives in Budapest, considered as one of the most important archives of the Cold War period. The project questions the act and mechanisms of archiving the “Other”, with a focus on the European East. It discusses the ways in which information is collected and transferred, the ways in which the East has gained an epistemic body through refraction, as well as the ways in which this body is reiterated today. The project brings together Irina Botea, Istvan Laszlo, Tincuta Heinzel, Lasse Scherffig, and Ioana Macrea-Toma.